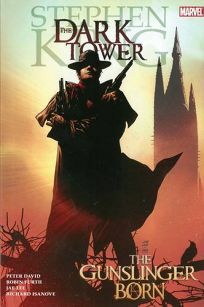 This comics adaptation (including prequel) of King's Dark Tower: The Gunslinger Born follows the early days of the Gunslinger, Roland Deschain. For the first hundred pages or so, you think you're in the old American West, until we come across a landscape littered with rusted oil rigs and vintage WW2 Panzer tanks. This sort of future-past otherworldliness typifies Roland's experience as he begins his quest as a teenage cross between Malory's Lancelot and Sergio Leone's Man with No Name. He and his young friends, high-born sons of the landowning political cadre called the Affiliation, are student-apprentices in a sect of knights bearing an arcane code of ethics, who must undergo strict training in order to bear the title Gunslinger. Early on, Roland earns the title Gunslinger by overcoming his teacher in a masterful fight sequence. Eventually, Roland and a group of fellow Gunslingers are sent to spy on the evil John Farson. Pretty soon, things get medieval. Maidens in distress appear, as do sadistic bad guys, witches and a weird monster called the Thinny. The Gunslinger's world is a weird hodge-podge of 1066 Hastings, 1865 Appomattoxand 1941 Warsaw—and in places the mélange is quite exciting. Still, a lot of The Gunslinger Born 's plot is unclear and the prose purplish. Characters walk on and walk off, communicating in monotonous speeches wedged between scenes of murder and torture. The requisite love affair between Roland and young Susan Delgado is a bit passionless, and there's very little mirth; emotional ranges stretch from grimacing endurance to abject misery. Writer/adapter Peter David turns some nice phrases in a sort of sub-Faulknerian style, but the wordiness slows the action. At times, artist Jae Lee and colorist Richard Isanove are left with little to do other than create static pinup pages to accompany the prose. Nevertheless, there is a palpable charisma embedded in The Gunslinger Born —you can tell everyone involved is having a blast. Lee's drawings are smoothly rendered and realistic, yet sensually illustrative, and his art has never seemed so warm. And there's a touch of legendary underground comics artists Richard Corbin and Frank Frazetta in Isanove's palettes. The Gunslinger Born is the perfect starting point for those who think comics contain nothing but men in spandex costumes and masks. If it hooks new readers, that's good enough for me. Paul Pope is the artist/writer of the Eisner Award–winning graphic novel Batman Year 100 (DC Comics) and PulpHope: The Art of Paul Pope, recently published by AdHouse Books.